Are you joining the Minecraft experience on Wii U? 08.12.2015: Minecraft: Wii U Edition won't lack the multiplayer features from other versions, publisher Microsoft has confirmed. Should Nintendo Resurrect Wave Race? 08.11.2015: Tamaki, who writes for Unseen64, has been delving into a Wave Race sequel that sunk before it even really began. Should Nintendo Use More Cutting-Edge Chips for NX? 18.10.2015: Journalist Takashi Mochizuki has expanded on comments about the NX's chipsets. If Nintendo remake The Legend of Zelda: Twilight Princess, which version should be used? 14.10.2015: Could Link's quest across Hyrule to save the land from the Twilight be officially remastered in HD? Do you feel Rare made the right move with shelving Twelve Tales: Conker 64? 03.10.2015: Rare animator Louise O'Conner reveals a, well, rare look at what could have been in Twelve Tales: Conker 64. Should Link be Played by a Female Actress in a Zelda Adaptation? 25.09.2015: In an interview with Mario producer Takashi Tezuka, he suggested Link should be played by a female actress. 18.09.2015: One of the biggest changes in Monster Hunter X will be playable felynes. What are your thoughts on the Star Fox Zero art-style? 13.09.2015: Nintendo director Yugo Hayashi has discussed the visual direction in Star Fox Zero. Which of Nintendo's franchises could you see become successful in Hollywood? 22.08.2015: Nintendo's famed game designer Shigeru Miyamoto has talked about the company's steps into the world of movies. Physical or eShop, which version of Project Zero: Maiden of Black Water will you go for? 05.08.2015: Project Zero: Maiden of Black Water is bringing a slither of fear to Wii U owners this October in Europe. Do you use standard or gyro Controls in Splatoon? 25.07.2015: Nintendo has revealed just how much the gyro controls have impacted the Splatoon experience, with a majority of players using them. Should Metroid Prime: Federation Force be Part of the Metroid Prime Universe? 21.07.2015: Nintendo's Kensuke Tanabe admitted that Nintendo expected a negative reaction to Metroid Prime: Federation Force. 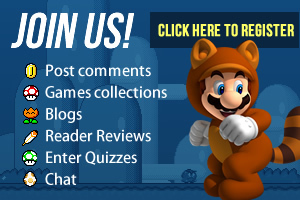 Should All Nintendo Online Games Have Voice Chat? 27.06.2015: Nintendo rep Julie Ganon was asked about why some online games have voice chat and others don't. Should Nintendo use a Third Party Base for NX? 02.06.2015: Nintendo have commented on recent rumours that the company's next console platform, Nintendo NX, would use Android. Are fresh faces needed for future Nintendo Direct presentations? 31.05.2015: A different chap presented Nintendo Direct today, but it hasn't ruled Iwata out from future sessions. Which Membership Systems Should Nintendo Take Inspiration From? 14.05.2015: Nintendo president Satoru Iwata isn't too happy with Nintendo's current crop of online services. Is Fire Hopping Still Relevant in Mario Kart 8? 27.04.2015: With Mario Kart 8 now racing along at increased speeds, fans are questioning whether the "fire hopping" technique is still relevant. Are Nintendo Wise to Move into the Smart Device Market? 17.03.2015: Iwata wants to redefine what exactly the Nintendo platform is, given plans to develop applications for smart devices. Would you enter amiibo Tournaments for Smash Bros.? 09.03.2015: Over in Japan, Nintendo will be hosting Super Smash Bros. tournaments for Wii U - the twist, however, is that they will be for amiibo. Metroid Prime vs Super Metroid? 07.03.2015: The latest issue of Nintendo Minute takes a look at a difficult question to answer: Super Metroid vs Metroid Prime. What Other Franchises Should Captain Toad Appear in? 22.02.2015: Nintendo's Koichi Hayashida wants the adorable Captain Toad to return in various other Nintendo games. Did you pick up a New Nintendo 3DS or New Nintendo 3DS XL console? 17.02.2015: The gaming community is abuzz with the launch of the New Nintendo 3DS consoles - but just how well have they done so far? Could Devil May Cry and Bayonetta Work as a Crossover? 11.02.2015: Ever wondered what the worlds of Devil May Cry and Bayonetta would look like, combined? Capcom's Rey Jimenez is keen to see that happen. Should Characters Have Been Unlocked at the Start in Smash Bros. for 3DS / Wii U? 02.02.2015: Super Smash Bros. producer Masahiro Sakurai is back with an insider look, noting how he considered having everyone unlocked. How would you prefer playing Monster Hunter? 17.01.2015: Monster Hunter 4 Ultimate director Kaname Fujioka described the reasons for Capcom's decision to continue the franchise on handheld. Would you buy a new F-Zero game? 06.01.2015: Fans are crying out for a new entry in the futuristic F-Zero series, but it all depends on the right controller. What Nintendo Franchises Would You Like to see in Maker Form? 04.01.2015: With Mario Maker proving popular with fans ahead of launch, could other Nintendo franchises get similar treatment? Can Mario Kart 8's Item Balancing Be Improved? 30.12.2014: Something seems amiss with the item balancing in Mario Kart 8, but is it a problem? Do cutscenes enhance or destract from the gaming experience? 28.12.2014: Nintendo president Satoru Iwata recently spoke about storylines and cutscenes in modern games. Which Zelda: Majora's Mask Pre-Order Gift will you go for? 23.12.2014: The moon is set to collide with the world of Termina next year, and retailers are offering pre-order incentives to celebrate.